Direct genetic traces of the earliest Native Americans have been identified for the first time in a new study. The genetic evidence suggests that people may have entered the continent in a single migratory wave, perhaps arriving more than 20,000 years ago. 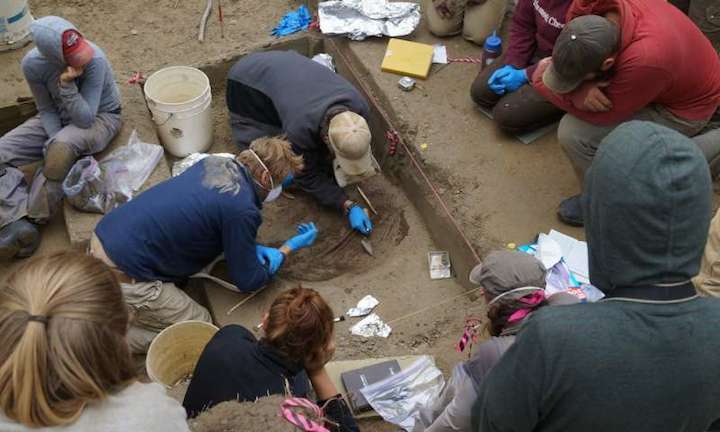 The data, which came from archaeological finds in Alaska, also points to the existence of a previously unknown Native American population, whom academics have named "Ancient Beringians". The findings are being published in the journal Nature and present possible answers to a series of long-standing questions about how the Americas were first populated. It is widely accepted that the earliest settlers crossed from what is now Russia into Alaska via an ancient land bridge spanning the Bering Strait which was submerged at the end of the last Ice Age. Issues such as whether there was one founding group or several, when they arrived, and what happened next, are the subject of extensive debate, however. In the new study, an international team of researchers led by academics from the Universities of Cambridge and Copenhagen sequenced the full genome of an infant - a girl named Xach'itee'aanenh t'eede gay, or Sunrise Child-girl, by the local Native community - whose remains were found at the Upward Sun River archaeological site in Alaska in 2013. To their surprise, they found that although the child had lived around 11,500 years ago, long after people first arrived in the region, her genetic information did not match either of the two recognised branches of early Native Americans, which are referred to as Northern and Southern. Instead, she appeared to have belonged to an entirely distinct Native American population, which they called Ancient Beringians. Further analyses then revealed that the Ancient Beringians were an offshoot of the same ancestor population as the Northern and Southern Native American groups, but that they separated from that population earlier in its history. This timeline allowed the researchers to construct a picture of how and when the continent might have been settled by a common, founding population of ancestral Native Americans, that gradually divided into these different sub-groupings. The study was led by Professor Eske Willerslev, who holds positions both at St John's College, University of Cambridge, UK, and the University of Copenhagen in Denmark. "The Ancient Beringians diversified from other Native Americans before any ancient or living Native American population sequenced to date. It's basically a relict population of an ancestral group which was common to all Native Americans, so the sequenced genetic data gave us enormous potential in terms of answering questions relating to the early peopling of the Americas," he said. "We were able to show that people probably entered Alaska before 20,000 years ago. It's the first time that we have had direct genomic evidence that all Native Americans can be traced back to one source population, via a single, founding migration event." The study compared data from the Upward Sun River remains with both ancient genomes, and those of numerous present-day populations. This allowed the researchers first to establish that the Ancient Beringian group was more closely related to early Native Americans than their Asian and Eurasian ancestors, and then to determine the precise nature of that relationship and how, over time, they split into distinct populations. Until now, the existence of two separate Northern and Southern branches of early Native Americans has divided academic opinion regarding how the continent was populated. Researchers have disagreed over whether these two branches split after humans entered Alaska, or whether they represent separate migrations. The Upward Sun River genome shows that Ancient Beringians were isolated from the common, ancestral Native American population, both before the Northern and Southern divide, and after the ancestral source population was itself isolated from other groups in Asia. The researchers say that this means it is likely there was one wave of migration into the Americas, with all subdivisions taking place thereafter. According to the researchers' timeline, the ancestral population first emerged as a separate group around 36,000 years ago, probably somewhere in northeast Asia. Constant contact with Asian populations continued until around 25,000 years ago, when the gene flow between the two groups ceased. This cessation was probably caused by brutal changes in the climate, which isolated the Native American ancestors. "It therefore probably indicates the point when people first started moving into Alaska," Willerslev said. Around the same time, there was a level of genetic exchange with an ancient North Eurasian population. Previous research by Willerslev has shown that a relatively specific, localised level of contact between this group, and East Asians, led to the emergence of a distinctive ancestral Native American population. Ancient Beringians themselves then separated from the ancestral group earlier than either the Northern or Southern branches around 20,000 years ago. Genetic contact continued with their Native American cousins, however, at least until the Upward Sun River girl was born in Alaska around 8,500 years later. The geographical proximity required for ongoing contact of this sort led the researchers to conclude that the initial migration into the Americas had probably already taken place when the Ancient Beringians broke away from the main ancestral line. Jos Vctor Moreno-Mayar, from the University of Copenhagen, said: "It looks as though this Ancient Beringian population was up there, in Alaska, from 20,000 years ago until 11,500 years ago, but they were already distinct from the wider Native American group." Finally, the researchers established that the Northern and Southern Native American branches only split between 17,000 and 14,000 years ago which, based on the wider evidence, indicates that they must have already been on the American continent south of the glacial ice. The divide probably occurred after their ancestors had passed through, or around, the Laurentide and Cordilleran ice sheets - two vast glaciers which covered what is now Canada and parts of the northern United States, but began to thaw at around this time. 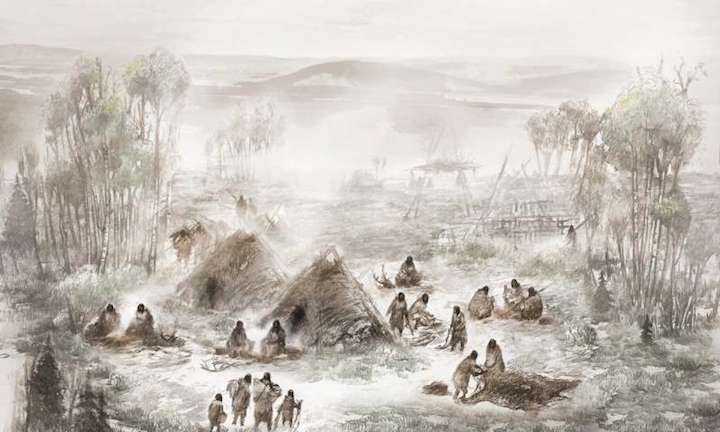 The continued existence of this ice sheet across much of the north of the continent would have isolated the southbound travellers from the Ancient Beringians in Alaska, who were eventually replaced or absorbed by other Native American populations. Although modern populations in both Alaska and northern Canada belong to the Northern Native American branch, the analysis shows that these derive from a later "back" migration north, long after the initial migration events. "One significant aspect of this research is that some people have claimed the presence of humans in the Americas dates back earlier - to 30,000 years, 40,000 years, or even more," Willerslev added. "We cannot prove that those claims are not true, but what we are saying, is that if they are correct, they could not possibly have been the direct ancestors to contemporary Native Americans." The study, Terminal Pleistocene Alaskan genome reveals first founding population of Native Americans, is published in Nature.